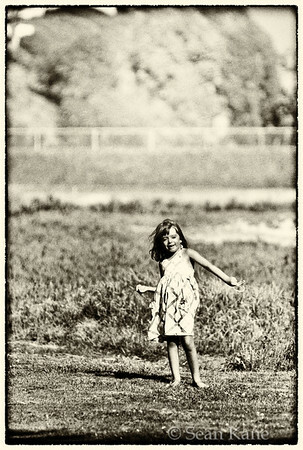 My youngest daughter was playing at the beach in Santa Barbara in her sun dress and I grabbed this photo. Everything about her pose, expression, the long grasses, sand and hill behind her screamed for a vintage look. I used Nik Silver Efex Pro to get the look I was going for. Some have said I need to crop it, and I can see why from a composition perspective, but I’ll be leaving it just as it is since I like the environment. This entry was posted on January 10, 2012 by Sean Kane. It was filed under Beach, People, Photos and was tagged with Beach, black and white, kid, Photography, santa barbara, vintage. Thanks much, Amelia and welcome! I love this as is! ‘Carefree’ – PERFECT title!